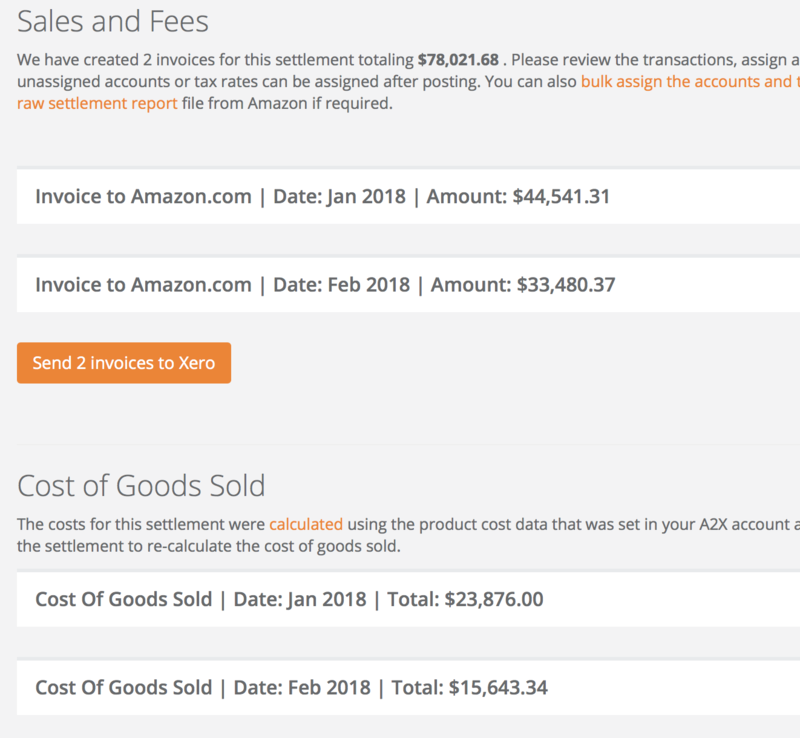 Cost of Goods Sold is a feature in A2X that will calculate the total cost of the products you sell on Amazon for each settlement period and send the transaction to your accounting system so that you can correctly record the changes in inventory and cost of sales. This will give you an accurate view of your gross profitability and margins directly in your financial reports. Why should you care about Cost of Goods Sold? In a very simplistic cash-based accounting system you might expense your stock purchases when they happen. So if you buy 100 T-shirts from your factory and they cost you $5 each, then in the month you buy them, you incur a $500 expense called 'purchases'. If you sell 20 T-shirts per month for $10 each, then you would have revenue of $200 in that month, and a $500 expense, uh-oh, you lost money this month, or did you? The next month would be much more profitable though, no stock purchases and $200 of revenue, all pure profit, or is it? This uneven view of your margin and profit is exactly why you will want to account for your stock on an accrual basis, matching the cost of the goods to the sales of those goods. In our scenario above, this new approach would mean in the month you purchase the stock, you record a $500 asset in your accounts called inventory. Then as you sell the stock, you expense the cost of just the product you sold. So if you sold 20 T-shirts for $10 each, and they cost you $5 each, then your sales are $200 and your cost of goods sold are $100. Your gross margin is $100, which is a more realistic view of your profitability. How to access Cost of Goods Sold features? The cost of goods sold feature is available as a standard offering on the Starter, Standard and Premium plans. Both of these are configured in A2X under the Costs tab. There are two ways you can provide A2X with your cost price data. The first method is the manage costs tab within A2X. On the Manage costs tab A2X may have already found a number of SKUs from your account. If you don't see any or all of your products listed you can initiate a refresh by clicking 'Refresh SKUs'. 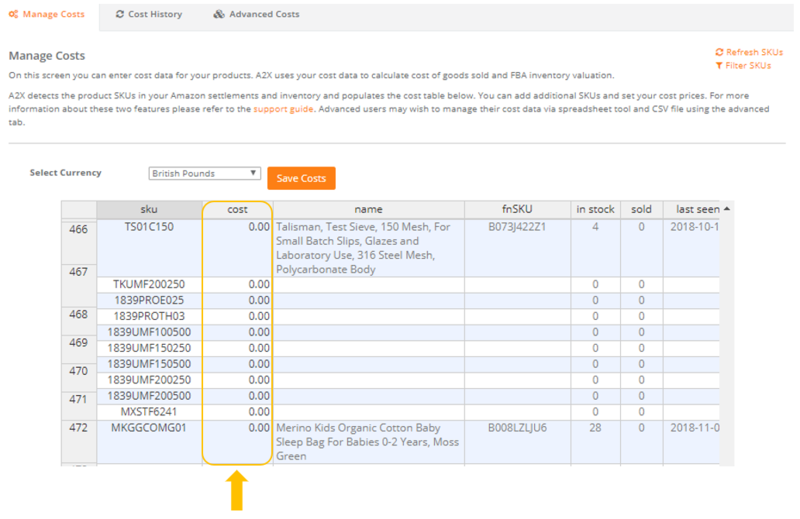 This will search recent settlements, and recent inventory (if you have FBA inventory) for SKU's. 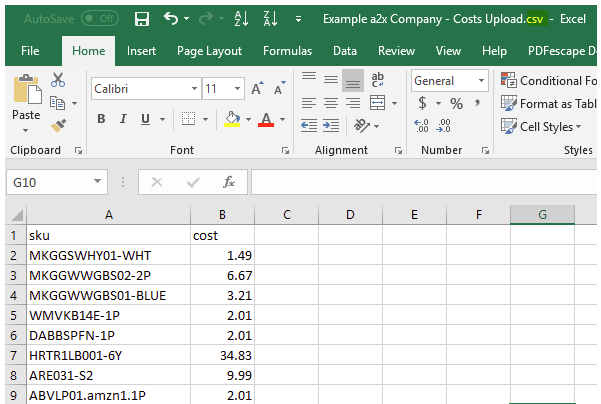 The second method for providing cost prices is a manual .csv file upload. 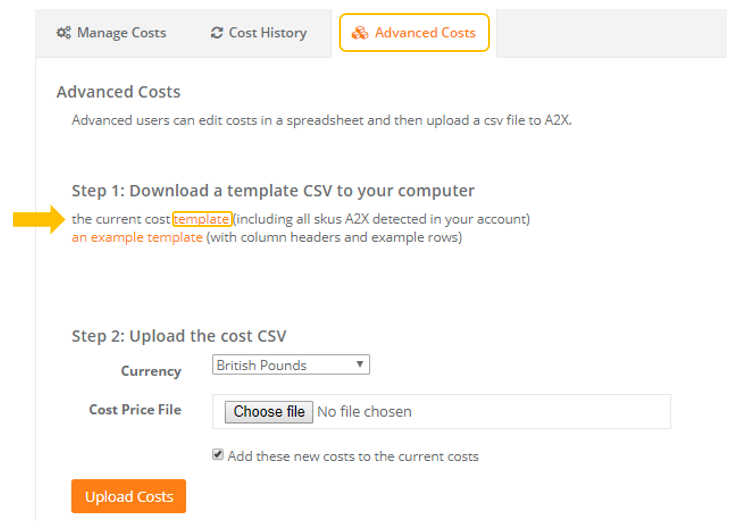 On the Advanced Costs tab you will see a link to download either the 'current cost template' or an example template. 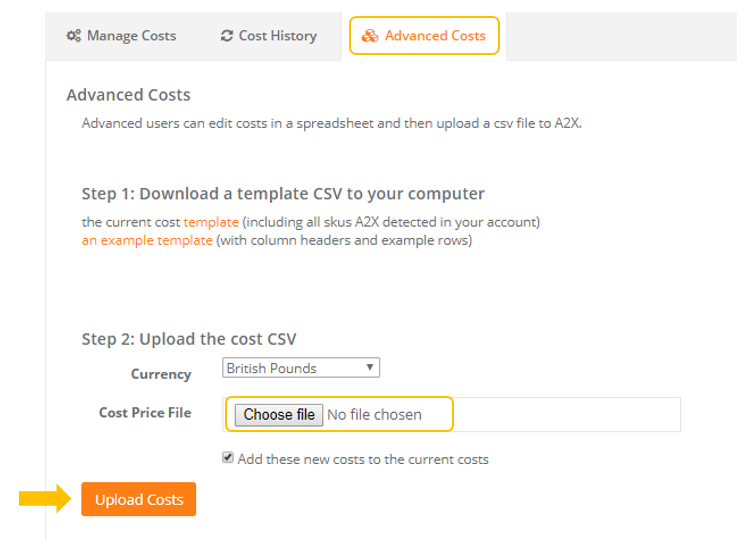 The current cost template is great to use if you have refreshed the SKU's in your A2X account. A2X will provide you with a template of all the SKU's we see in your account so all you need to do is enter the cost prices. Once you have populated your template with the cost prices it is now time to upload it to A2X. In your accounting system's chart of account you will need an Inventory Current Asset account and a Cost of Goods Sold Expense account. Turn on "Enable Cost of Goods Sold". Set your accounts to map to your accounting software here in Costs. There are several options for mapping COGS transactions. They can be split by FBA, Merchant Fulfilled, and non-Amazon. Click on the + sign to the right. You can account for COGS on one level or expand to other levels if you business requires this level of tracking. Pro tip: There is a delay after creating accounts in your accounting system to when they appear in A2X, you can force the cache to refresh under Settings > Connections in A2X. If you do not see any cost information in your settlement when you review it, click the 'refresh' link for that settlement, this will force A2X to apply the newly uploaded costs to this settlement. When you send them over to Xero, they can be found in Draft Bills. To commit the changes to COGS and inventory, approve the bill, even though it is zero. When you send them over to QuickBooks Online, they are found in the Bank Journals split between the various inventory and COGS accounts. After you enable COGS in the A2X settings, and upload your costs and configure your asset and expense accounts, you will need to refresh any old settlement periods that you wish to recalculate the COGS data for. You can do this on a single settlement by clicking the Refresh link, or use the bulk tools (click the little spanner icon) to refresh multiple settlement periods at once. When the settlement has been refreshed you can click Review to see the details of the COGS for that period, and send the data to your accounting system. The COGS invoices will appear below the usual Sales and Fees invoices, you will see one or two invoices depending on whether the settlement period spans more than one month. Each Amazon settlement is processed, the quantity of product sold is calculated and the cost value of the product is totaled into invoices in the same way as the sales and fees. You can configure A2X to include or exclude the non-Amazon shipments, which allows COGS calculations for non-Amazon sales shipped from Amazon FBA. You can upload different cost data and refresh a settlement to have A2X re-calculate the new cost of goods sold values by clicking Refresh. When all SKUs have a cost associated with them, you can send the invoices to your accounting system by pressing the 'Send Invoices' button. When you send the COGS invoices to Xero they will always total to zero and be considered 'Bills'. The invoices reflect a non-cash movement of inventory asset value to cost of goods sold expense. The accounts chosen in A2X settings will be used on the invoice. You can view the specific details on the invoice including the source of the cost data used for the calculation, A2X aggregates the totals in the invoice. Each COGS invoice sent to your accounting system will have supporting data attached so that the calculations that were used can be recreated should they be required during audit or review. When you send the COGS data to QuickBooks, it will be a Journal Entry, one for each month and attached to the journal will be the source data. The journal will be a non-cash journal as it debits the expense account and credits the asset account for the same amount.